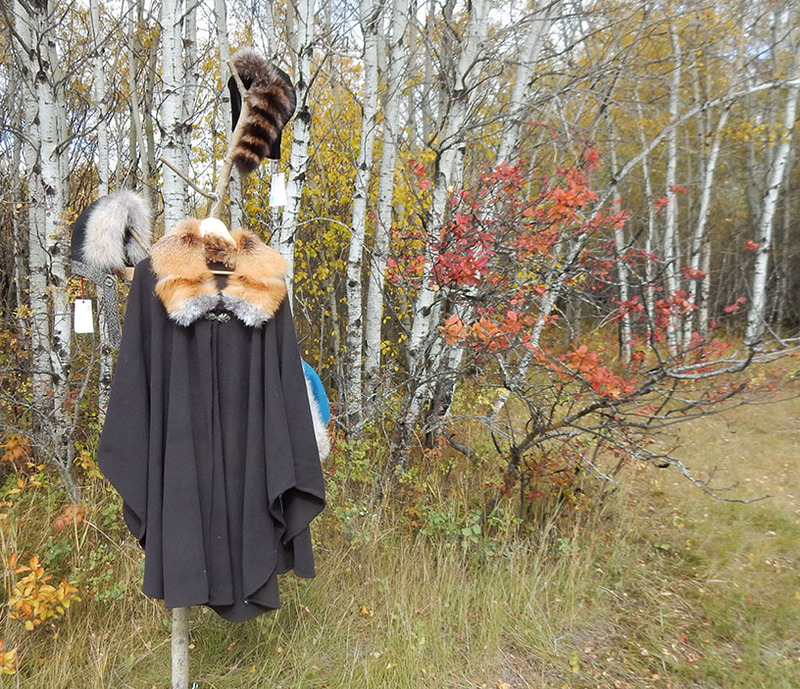 Fur trapping has been a part of Canada's history from the begining. The Metis people were active in the fur trade across Canada. Today it is still a means of livelihood for many people in the far north. One example is the "Northern Saskatchewan Trappers Association Co-operative". 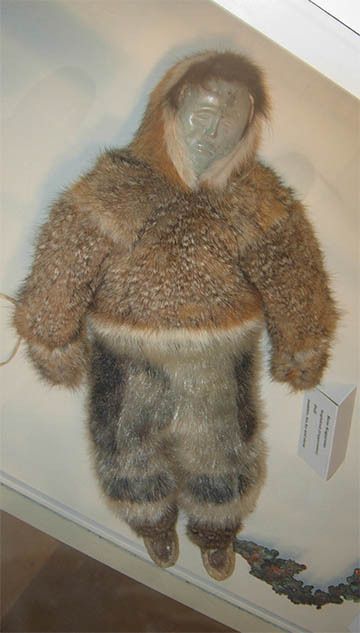 Clothing made of natural fur is also still a means of personal survival for Inuit peoples in the far north. The fur apparel they have worn is shown on this Inuit doll with a soapstone carved face. The doll is part of the First Nations art collection on display in the Agriculture Building of the University of Saskatchewan, donated by Cheryl and Henry Kloppenburg. The doll was made of sealskin, fox fur and stone by Rose Kogayona of Kugluktuk (Coppermine). Nelles, D., and George Pimentel (Jan/Feb 2015). "Howl: Why Tanya Tagaq sings." Walrus: 30-33, 35, 37 & 39. 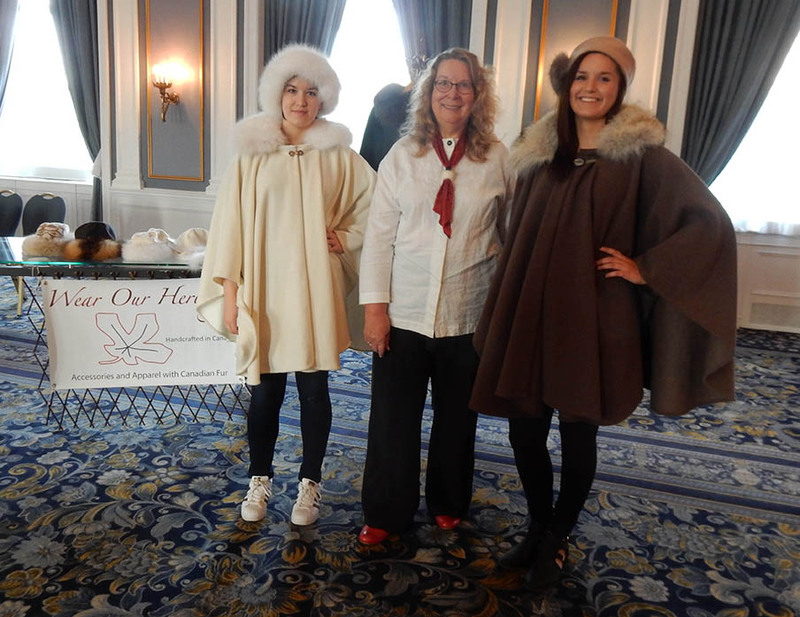 We encourage you to wear real fur and support this part of our heritage! This website is meant to help source fur garments and materials in Canada. In recent years, such items have become harder to find, and purchase in some areas. Canada is cold much of the year, so wearing garments with natural fur serves a useful purpose, not just a fashionable purpose. However, fur trim can also add luxury and beauty to clothing, as well as warmth. Sheila entered three fur trimmed items at the Saskatchewan Art Showcase of the Saskatoon Exhibition in August 2017, in the theme category. The theme was "Canada 150". 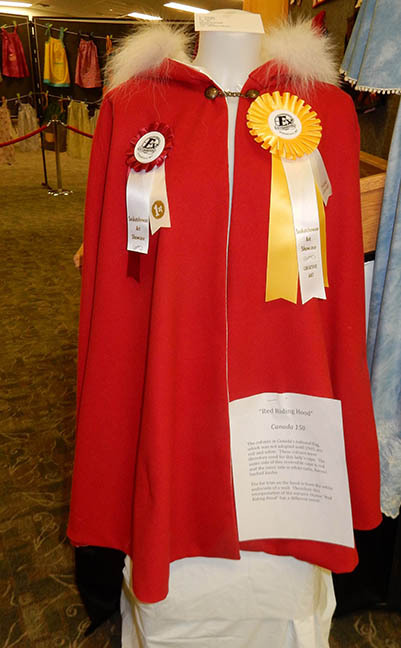 The Red Riding Hood Cape shown at the right won first prize in a subcategory and first prize in the Theme Division. The "Design Sheet"for this item pinned to it states: The colours in Canada's national flag, which was not adopted until 1965, are red and white. These colours were therefore used for this lady's cape. The outer side of this reversible cape is red and the inner side is white satin, flannel backed kasha. The fur trim on the hood is from the white underside of a wolf. Therefore this interpretation of the nursery rhyme "Red Riding Hood" has a different twist! As part of the Saskatoon Fashion and Design Festival 2017, Sheila was interviewed by Janella Hamilton in a spot on CTV Morning Live. She is shown at the left with the two lovely models that appeared. More illustrations of the fur trimmed accessories I make are available on a linked page. Most of these items are currently available only at craft fairs in Saskatchewan. In 2019, the option to order some items online and have them mailed within Candada became available. Some items are designed to be "one-size-fits-all" and are the best choices if the item is to be a gift. Hats must fit so will not be mailed. A few items are designed specifically for Renaissance Faire wear or other Medieval events.. Craft Exhibits and Shows where Sheila plans to have a Wear Our Heritage Booth in Fall 2019. Curated Fall Market September 6 & 7, TCU Place, 22nd St. Saskatoon. Christmas Craft Fair, Western Development Museum, Saskatoon, October, 2019. Sundog Arts & Entertainment Faire, Sasktel Centre, Saskatoon, Nov. 29, 30 & Dec. 1, 2019. Craft Exhibits and Shows where Sheila had a Wear Our Heritage Booth in Fall 2018. Christmas Craft Fair, Western Development Museum, Saskatoon, October 12-13, 2018. Evergreen, E.A. Rawlinson Centre, Prince Albert, SK. Nov. 2-3, 2018. Sponsored by the Prince Albert Council for the Arts. Sundog Arts & Entertainment Faire, Sasktel Centre, Saskatoon, Nov. 30 - Dec. 2, 2018. Thanks to everyone who purchased a fur trimmed garment in fall 2018! Enjoy wearing it for years to come! The "booth" at the right was at the Western Development Museum's Christmas Craft Fair in Saskatoon on October 112-13, 2018. It won 1st prize for display. 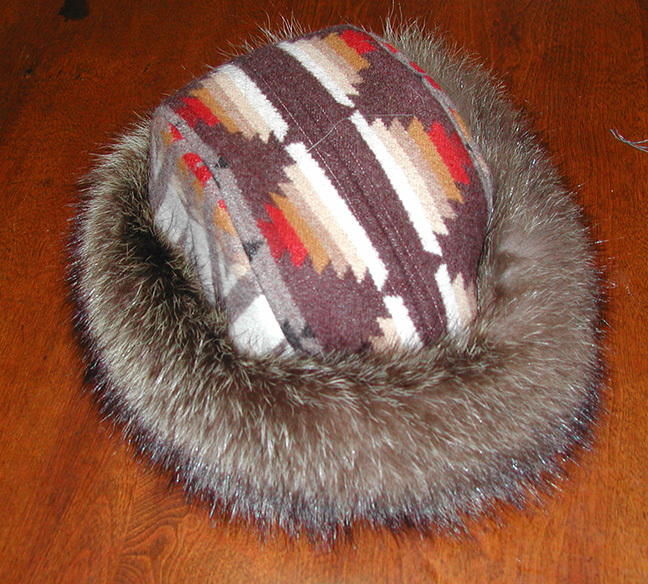 Some hats have been made of Pendleton wools. A couple of these are available at Last Shoes, (318 Ave C South, Saskatoon) where Adam Finn designs and handcrafts shoes, boots, and other leather accesssories. Pendleton blankets were and are associated with First Nations people, as trade blankets, often for fur pelts. 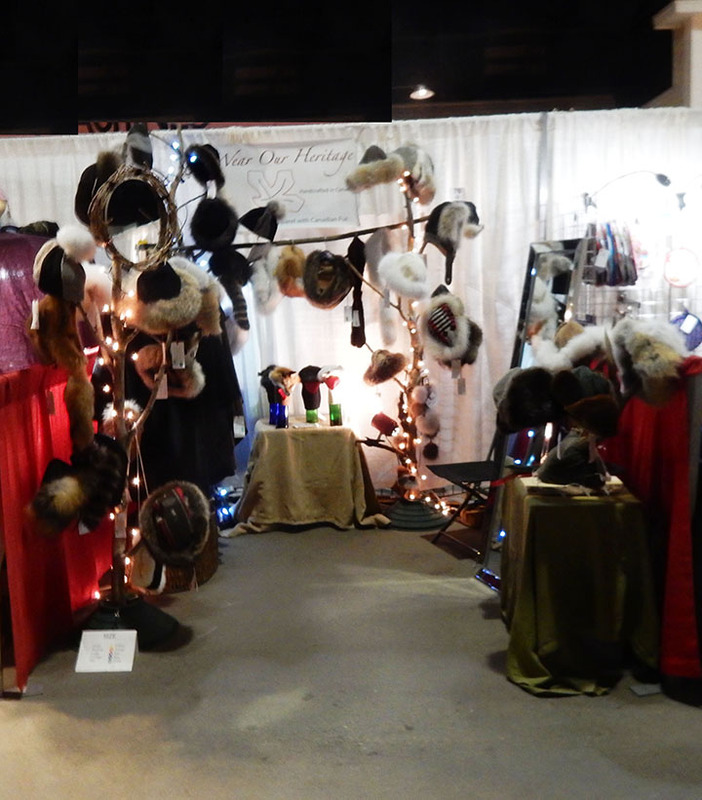 A few fur trimmed hats and capes are in Rumour Handcraft Gallery at the Regina airport. Sheila is proud to be included in the Artisan Canada directory.